REELRADIO - The Bruce Portzer Collection! Bruce at his listening post in 1970. A picture of Bruce at Christmas, 2001, taken by his ten-year-old son Steven. Bruce Portzer has lived most of his life in the Seattle area. He grew up listening to stations like KOL and KJR, Seattle's Top 40 powerhouses in the late 60's. Both stations were entertaining, intensely competitive, played great music, and had wonderful on-air talents, like Robert O. Smith, Lan Roberts, and Burl Barer, to name a few. His radio interests began in grade school by building a one-tube receiver, which picked up a few local AM stations. When he was twelve, he discovered AM DXing and the thrill of hearing stations hundreds or thousands of miles away. Vancouver's two Top 40 stations, CFUN and CKLG, came in all day long, offering songs and DJs he couldn't otherwise hear. At night he sometimes listened to clear channel stations from other parts of the country, as well as small town stations in the Pacific Northwest and western Canada. From there his interests grew: "During high school and college, I was a veritable radio junkie. I collected record surveys, bumper stickers, and other radio memorabilia. While traveling, I sometimes visited stations for impromptu tours, oftentimes getting into the control room and chatting with the DJs. I also swapped airchecks with friends around the US and Canada. At the time, I wasn't into building a tape archive. I would listen to the tape a time or two, record some local stations over top of it, send it back, and wait for the next one to show up. As a result, a lot of great recordings were sent to that Big Tape Archive in the Sky, but I held on to a few of them as well as some I made for myself." 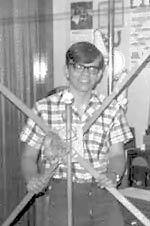 Bruce was an announcer at the University of Washington's 10-watt FM station, KCMU, but that was the extent of his on-air experience. He majored in Electrical Engineering, with the idea of doing something broadcast-related after graduation, but the broadcast part never quite came together. He worked in the aerospace and two-way radio fields for a while, and then spent 18 years with a couple of consulting firms, designing communications systems for clients around the country. He's been in the wireless industry since 1996, and currently works for AT&T Wireless Services. He notes, "my early interest in radio not only influenced by career choice, but turned into a fascinating lifelong hobby. REELRADIO rekindled my early interest in Top 40 radio and the excitement that went with it. I'm thrilled to share a few of my own airchecks." The Repository thanks Bruce Portzer for sharing!
. . . This is Alan Freed, the old King of the Moondoggers . . .
Our thanks to contributor Bruce Portzer for this unscoped version of a REELRADIO Classic: Alan Freed "The Moondog", WJW, 1954. The original 'scoped exhibit (from Programmer's Digest, November 1973) was HITBOUND on March 29, 1997. Now, on February 23, 2003, we are pleased to introduce this contribution from Bruce, which is not only unscoped, but includes an additional segment that was not featured in the Programmer's Digest excerpt. Bruce places this aircheck from March or April of 1954, based on Freed's mention of a Palm Sunday (April 11, 1954) concert.
. . . As you can gather, it's a pretty sophisticated show . . . This aircheck contains everything I know about Paul Revere. I suspect that's not his real name. There's a lot going on in this earlybird segment of his show, starting with a theme song and pleasant-sounding chimes. Features include today's birthdays (actor Walter Abel and Indiana Senator Homer Capehart), the big thing today in history (the Allied invasion of France in WW2), and a response to a listener's complaint about daylight savings time. There are several public service announcements (including two to "Boost Rhode Island") and a few greetings to listeners. Jingles are conspicuously absent, but Paul does have a penchant for reverb-on-demand.
. . . Stuff it right inside your left ventricle, honey. It won't hurt a bit . . .
Burl Barer joined KOL in 1969 after stints at KJR and KYAC, a local R&B station. His lively patter and quick wit soon attracted a strong following. Like many of KOL's better DJ's, he came across as larger than life and down to earth at the same time. He usually worked evening and late night air shifts. Here's Burl at the start of Labor Day Weekend. As luck would have it, he has a cold. Somehow, he manages to be entertaining, with several good lines about his condition. There are many youth-oriented spots here, and he quips about a couple of them. There's also a Bob and Ray spot for the Space Needle. At one point, he goes into a Muscular Dystrophy PSA, realizes he needs to be serious for a moment, and then goes back to clowning around. Burl returned to KJR in the mid 70's and has since enjoyed a multifaceted career in marketing, public relations, and production work. In recent years, he's become an author, and written several fiction and non-fiction books. One of his works won a coveted Edgar Award. He recently moved back to the Seattle area after living for several years in Walla Walla, Washington (yes, there really is such a place).
. . . Welcome to another episode of heart-rending contemporary radio . . . I made this recording while on vacation, using a portable radio and a cheap reel-to-reel recorder. John Rook was offered the PD position at market leader KIMN while he was with KTLK, and that was enough to get him sent to KQV, according to this KTLK tribute page. As #2, KTLK must've been trying harder - this 'check includes some good jingles and great songs, including album cuts. Plenty of advertisers, too, so they must have been doing something right. Note the vintage spots for Seven-up and Sprite a few minutes apart, and Cousin Brucie for Protein 29. I wish I understood the jokes about the Weather Mother.
. . . What'd you finally pay for it  Thirty-five cents? . . .
Charlie Brown took over KJR's morning shift in 1974, when Emperor Lee Smith moved to the sales department. Before that, he had done mornings at KJR's sister station KJRB in Spokane, plus a few months of evenings at KJR in 1968. Charlie's voice character, Clydie, is featured prominently in this aircheck. The KJR Wakeup Lady, Roy Otis, Orlando Wallmacher, and a number of listeners can also be heard. By this time, the classic KJR jingles had been shortened by removing the "Channel 95" from the end, leaving just "KJR Seattle". Charlie left for KUBE-FM in 1980, where he and partner Ty Flint held down the morning shift until the mid 90's. After a couple of years of oldies at KJR-FM, he retired from broadcasting. As of May, 2003, Charlie heads a company that produces audio editing software.
. . . Can you put wet overshoes on a radio? . . .
Near the beginning of this KJR aircheck, Ichabod Caine gives the date as Wednesday March 3, but it's actually March 2 (March 3, 1977 was a Thursday). Newsman Les Parsons gives the correct date later in the aircheck. There's no shortage of jokes on Ichabod's morning show, and most are punctuated with a horn or some other oddball noise. He's joined by a couple of voice characters. One of them, Captain Danny, comes complete with background sounds from a sailing ship. There is also an amusing contest, where 5-8 year old listeners ask questions about their favorite fairy tales. To no surprise, Ichabod can't answer this hour's question, and the 8 year old contestant scores prizes for himself and his parents. At one point, he asks "whatzamatter Brown, ain't they paying you enough in Dallas?" This was after a spot done by the previous morning host, Charlie Brown. Charlie had left for KLIF a few months earlier, but was still doing voice work for Seattle clients. Charlie's time in Dallas was, nonetheless, brief. By early spring he was back at KJR, and Ichabod moved to a different time slot, or a different station, or whatever. Ichabod has worked at country stations since the early 80's. Most of that time has been at KMPS, where he has one of Seattle's highest rated morning shows. 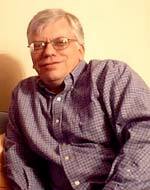 REELRADIO introduced The Bruce Portzer Collection on February 23, 2003!